I’ve been here before. The coloured wall on the right is where you could learn to be a clown! Nah, the world is full of clowns, I mean you can learn Circus Skills. I remember walking on those cobble stones to find a penny. 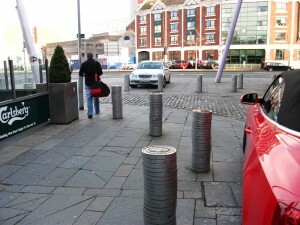 It was actually to find a lottery worth of them stacked in bundles all over the street! It was only last week, you must remember. Did you notice the drunken angled poles? One almost straight in front of you (pun intended) and the other way off to the left. 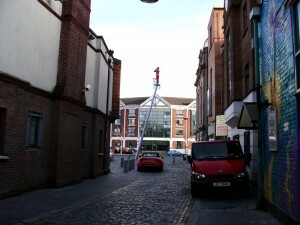 The Calling is an outdoor sculpture located at Gordon Street/Dunbar Link in Belfast. This work is based on the theme of communication between people and their environment. 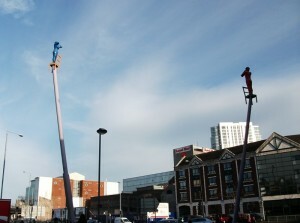 It consists of a bright red stylised human figure standing on a green chair and a bright blue figure standing on a yellow chair, calling into the distance while balancing atop extended (and angled} piston-like poles. Paddy McCann is a Belfast-based artist, whose work encompasses a wide range of disciplines, including painting, print and sculpture. He gained an MA from the University of Belfast in 1989. He exhibits widely throughout Ireland and internationally. His work is represented in many private and public collections including the Arts Council of Great Britain. This entry was posted in Sculpture on January 15, 2012 by Grannymar.